This marks the second large drug arrest for Deputy Mitchell and the new K-9 Deputies, Cane and Abel, in less than a week. 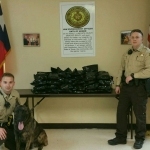 Deputies Barnett, Abel and Mitchell stand with 29 pounds of confiscated marijuana. Deputy Barnett stands with his K-9 partner Deputy Abel.